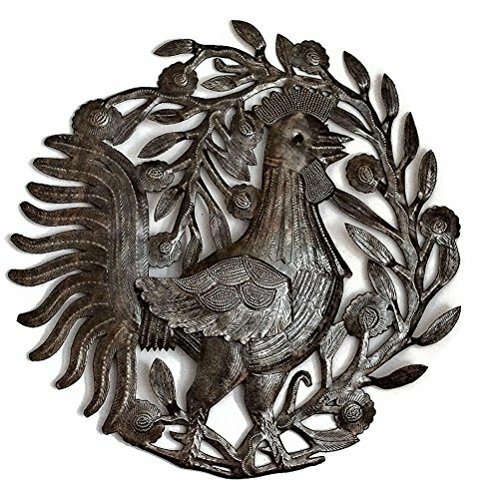 This is a hand-crafted original piece of Haitian metal art, made from recycled steel drums and brought to you through fair trade practices. It is created in traditional fashion; the artist utilizing simple hand tools for both the cutwork and detailing. A protective, weather-proof coating has been applied, making it suitable for display indoors or out.A few nails and a hammer are all you'll need to hang your sculpture. Look for a place where the design is joined or notched and put the first nail there. Use a second and possibly a third nail, if the piece is large, in other joined or notched design elements within the sculpture to straighten and secure it to the wall. Make sure that you avoid placing a nail into an eye or mouth, as that will draw attention to the nail. You want the nails to "disappear" into the piece.Made of recycled steel, this sculpture will rust over time if it is exposed to the elements. This isn't necessarily a bad thing, some people like the look of a weathered patina. If that isn't you, don't dispair. Taking five minutes once a year to apply a spray-on enamel clear coat will keep your sculpture looking exactly the same as the day you bought it. A cheery rooster to wish you a good morning with a hale and hearty cry. His wing is riveted on to give him a 3-D quality. It will be shipped pressed down flat so be sure to bend the wing out a little bit for full effect. Housewarming gift or indoor and outdoor home decor. Fair trade is the name of the game and it's the only way we play. If you have any questions about this product by it's cactus - metal art haiti, contact us by completing and submitting the form below. If you are looking for a specif part number, please include it with your message.